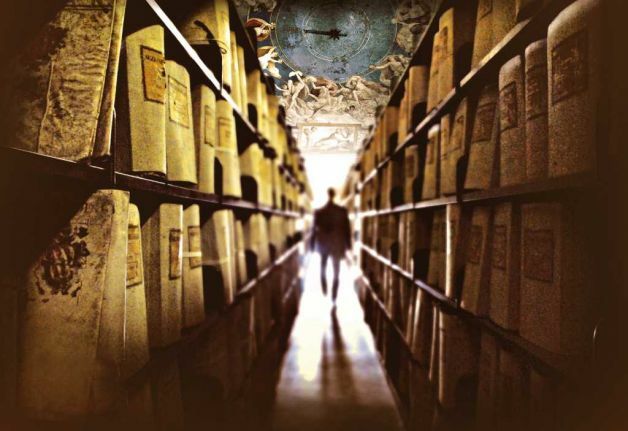 What secrets are in the Vatican Archives? Virtually all Roman Catholic conspiracy theories connect to the Vatican’s Secret Archives. The archives are housed in a section of the Vatican Library, adjacent to the Vatican Museum, at the northern boundary of Vatican City. The Archives have their own website, operated by the Vatican, which states that the documents housed inside pertain to such boring matters as papal expenditure accounts, state correspondence, individual correspondence, including original letters written by Michelangelo Buonarroti to Pope Julius II and other Catholic authorities. The conspiracy theory, however, is interested in more mysterious matters. Given that the Archives are estimated to house 53 miles of books, there are sure to be some intriguing finds inside. But why would an institution as powerful as the Roman Catholic Church feel the need to keep these documents secret? Are they afraid of what might happen if the public should learn of certain information? That is what the conspiracy theorists believe. Some of the more broadly sweeping theories claim documentation of the Jesus bloodline; secular historical proof of Jesus’s existence, in the form of correspondence between Saint Paul and Emperor Nero; secular historical proof via the same correspondence that Jesus did not exist; contemporary depictions of Jesus (that is to say, formal portraits of Jesus made by people who actually saw and depicted him in real life, whereas the earliest known depictions of Jesus, which clearly intended to represent him directly, date from the late 2nd Century AD). This line of the theory can go on ad infinitum, and has accused the Church of hiding proof in the Archives of the existence of various Biblical relics, either the relics themselves, or reliable documentation as to their whereabouts, including the Ark of the Covenant, the Holy Grail, the True Cross, the truth about the Shroud of Turin, and many others. Absolutely no one is allowed into the Archives, not even Cardinals. It is not well explained, on the Archives’ website, whether the Pope is allowed to go in or not. Anyone who wants to see a document from the Archives must ask in advance, and thus, must know in advance if such a document even exists. The only four people on earth known to have access to the Archives are Cardinals Raffaele Farina (the Archivist, or Librarian), Jorge Maria Mejia and Luigi Poggi (Archivists Emeriti), and Prefect of the Secret Archives Sergio Pagano. There is only one entrance into the Archives: from the main library, go by way of Porta Angelica, through Porta di Santa Anna. The Vatican Swiss Guard patrols this entrance at all times. It should be noted that contrary to the beliefs of those who hold to this theory, the documents in the Vatican archives which relate to Popes who reigned 75 years earlier are made available to the public. This most recently happened in 2006 when Pope Benedict XVI gave permission for the viewing of all documents relating to the reign of Pope Pius XI. This theory is likely to gain in popularity with the release of yet another completely erroneous film based on the book Angels and Demons by Dan Brown.